Vermont is a special place. A photographer's world of perfect compositions. Small picturesque villages with white steepled churches and quaint houses nestled in the valleys. Old farm houses and red barns on the rolling hills and meadows. A countryside that changes color and character with each season. Everywhere you look you see photo possibilities and each photo scenic should be visited again and again to catch the various moods, whims, lighting and designs of nature. All these ingredients add that extra touch for award-winning photographs on your first visit to "Photographers Paradise". 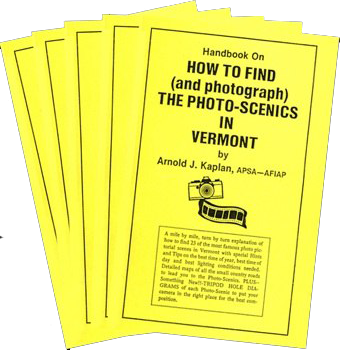 "HOW TO FIND AND PHOTOGRAPH THE PHOTO-SCENICS IN VERMONT"
This book plans your photographic day, to have you at the right photo-scenic at the right time of day for the best lighting condition. New color photo inserts and a DVD with photos of the famous scenes are included. Mini color insert of photos show most of the scenes, plus some new ones. The Vermont Guidebook is priced at $22.00, plus $2.50 U.S. postage first class. Click on the "Buy Now" button above to purchase it online. Otherwise, you can order via email and pay with PAYPAL using ID AJKGuidebooks@hotmail.com, or send a check to CLAIRE STERN at 3916 Sanna Wind Way, Langley, Whidbey Island, WA 98260. Be sure to include both your shipping address and email address with your order.